Part 1 is here; and fancy gifs are here. NOTE: Click thumbnail for a small version of photo. 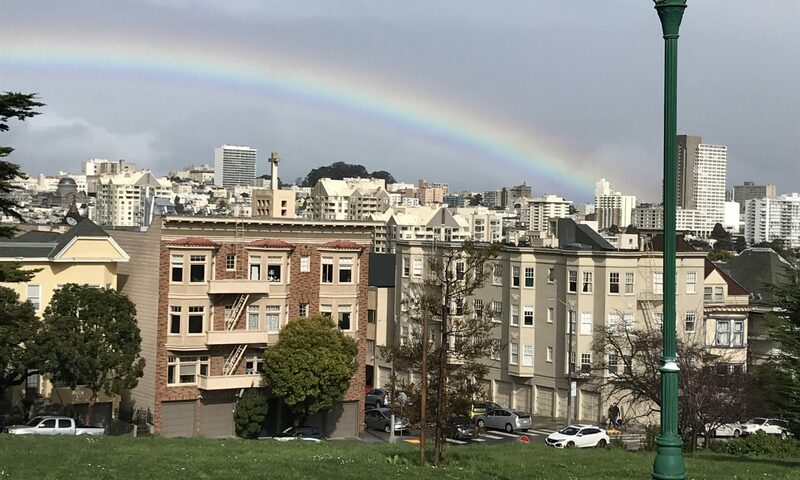 Click again for full size. Attempt to get full mobile. 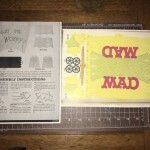 One happy crafter; two thumbs up. Wow! After about two hours of work, the mobile is completely assembled. Thing is, it’s horizontal so technically not yet a mobile. Where to hang this thing? It is about three feet long and two feet wide. Hanging off a wall won’t work. I found a spare shower curtain hook, taped it to the floor light I was using, and put the top string’s tied-off loop onto the hook. Picking the mobile up, I realized that it is very light. I feels delicate, and all the straws are drooping (i.e., leaning vertical)! Clarke’s brilliant note about “sliding the straw back and forth to balance” the parts did the trick. It took a tiny adjustment here, a little nudge there, and some more sliding over there to get the straws to start balancing and hanging horizontal. Interestingly the bottom parts started taking shape first, so I worked down to up to get the mobile to hang properly. I worried that the top straw wasn’t going to balance properly, so put some tape on what I thought was the lighter end to get it to balance. Not sure if I needed to do this. I kept moving the center threads in very small amounts. 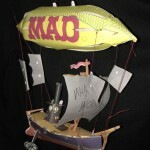 Suddenly, it all worked: a balanced, hanging MAD mobile! 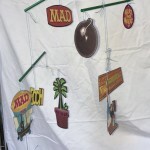 Being a kinesthetic object, the mobile has depth and movement. It constantly looks different, which is very cool. At first, I was anxious walking past it too fast, fearing that it would fall apart. But Clarke’s design skills must have included the fact that the mobile should take breezy walk-bys. I was also afraid to take it off the hook, so left it on the lamp over night. The next day, it was still hanging and moving fine. My Sweetie gave it a few puffs of air to see it move. It is tougher than it appears (and weighs. It probably only weighs an ounce at the most). 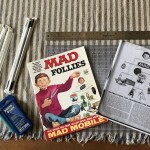 I had joked that there was no way a child could hold the mobile like Alfred was doing on the MAD Follies cover, but I was proven wrong. I set up a hook on a hanging ceiling light and had no problem moving the mobile to its new spot. I did go slow, but it kept its shape as I held it and walked the three feet to a more permanent hanging spot. 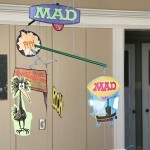 I really do not have a place to display the mobile, so I do not know how long it will hang. One thing to think about while it hangs is how gravity will pull the threads from the paper parts, especially with Alfred’s head. 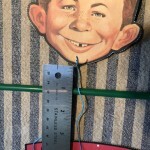 Alfred E. Neuman holds all the mobile’s weight, so I wonder if the old, dry paper can keep the thread from working through and falling apart. 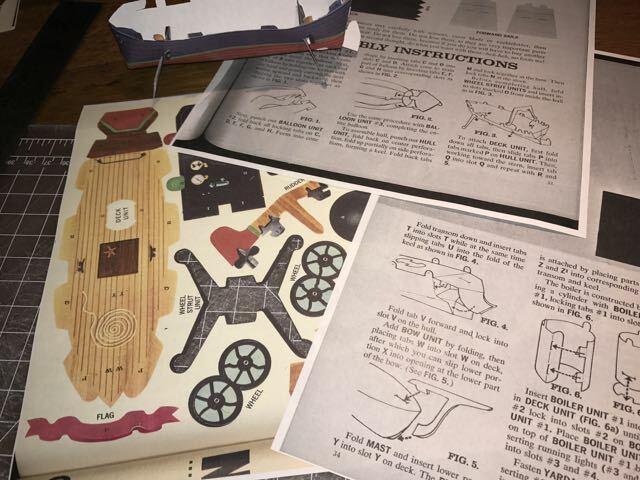 The main reason I assembled the mobile – and the zeppelin – is because there are no photos or recorded/written documents of how and what these MAD inserts were like to assemble. Taking a photo of a moving object proved tricky. It kind of has a front, which is constantly changing. I spent a good deal of time following Alfred’s face and waiting for the two Spys to align. I pulled out a white sheet and had my Sweetie stand behind the mobile so I could get the objects to “pop” and not get lost in the background. She eventually took better photos while I held the sheet. One VERY FUN thing is creating gif loops with close ups from the iPhone’s live function. I made a few videos too, which were fun, but the mobile gets lost with anything behind it. In general, the depth of Clarke’s mobile makes it a more enjoyable in-person experience. 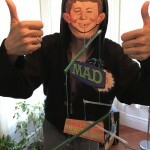 And it is also fun to see how he got creative with the two-sided aspect of the parts. For example, “ECCH” has the E and the H spaced in a way that it reads correctly both ways. 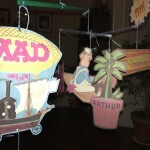 And Clarke put different gags on the panel that the Don Martin figure is painting as well as the egg and Arthur parts. HOW ABOUT THAT ZEPPELIN? HOW ABOUT BOB CLARKE? After almost two years, the zeppelin is still on display and still staying together. 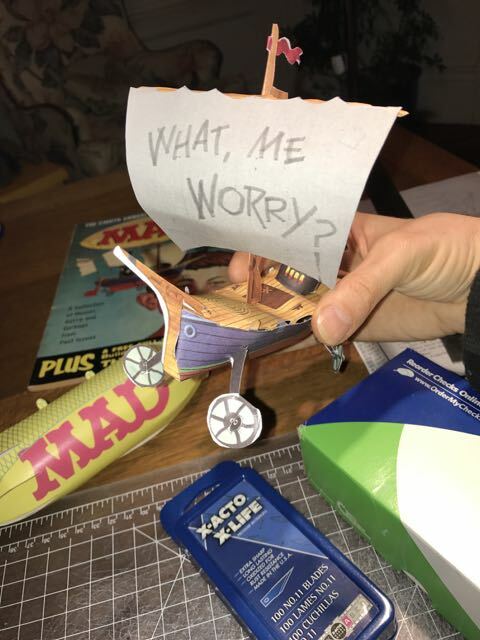 The mast still proves to be the weak spot due to using plain photocopy paper, but the vessel is still ship shape. After a few months, the mobile is still hanging fine on the ceiling light. We frequently adjust the tied middle threads to make it balance better, and the paper shows no stress at the tied threads. It still isn’t an ideal location, but is good enough for now. I am glad that Gaines and Feldstein let Clarke create these two mid-1960s inserts. 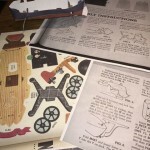 Unlike all the other special bonuses, these took craftiness, skill, patience, and creativity to design and assemble. Clarke pulled off designing both of these objects with great thought and care. Even tough the mobile instructions end stating that “everything falls apart, you tear your hair out, and you swear never to buy MAD again,” there is room for getting it right. And we have Bob Clarke to thank for knowing that his designs would work. 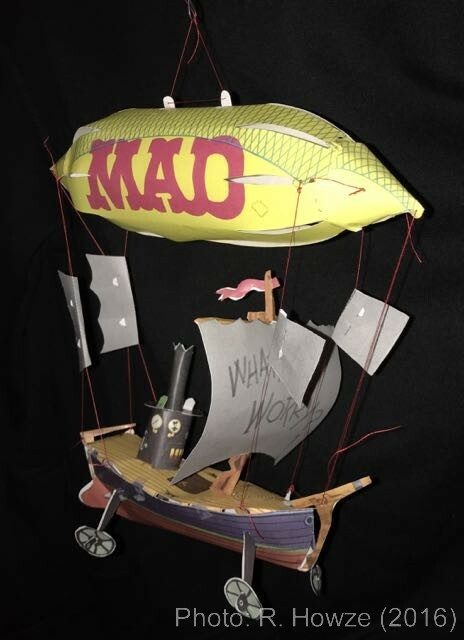 More MAD Mobile pages: Part 1 is here; and fancy gifs are here. Part 2 is here; and fancy gifs are here. 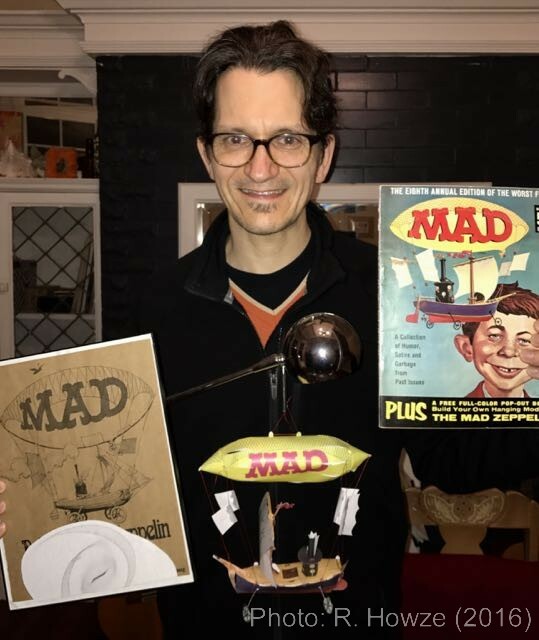 After constructing the MAD zeppelin, designed by Bob Clarke for the 1965 “The Worst From MAD,” almost two years ago, I had already decided that I was going to build Clarke’s 1966 MAD mobile next. 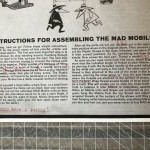 I bought a copy of the MAD Follies Number 4 right after buying the Worst From and made the mobile’s color photocopies at the same time I copied the zeppelin insert. 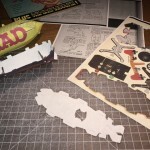 The zeppelin proved to be a fun and moderately difficult project, with the major flaw being the thin paper stock I used. 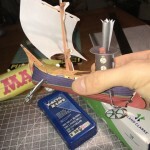 The most difficult step was the threading/rigging of the two main parts. With copies in hand, I sat on the assembly for months, mostly fretting over the situation with the paper. 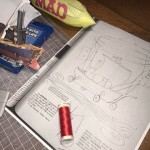 Unlike the zeppelin, the mobile is two sided, and Clarke had only put the “cut here” hashed line on one side of the insert. 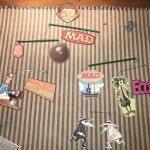 Cutting two parts of each piece, gluing them together, and then threading them on the straws just didn’t sit well with me. 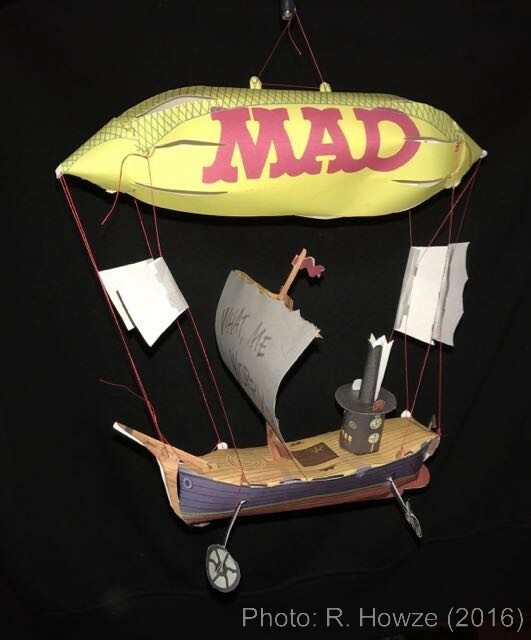 After the delay, I finally bought a low-grade copy of the MAD Follies that still had an intact mobile. 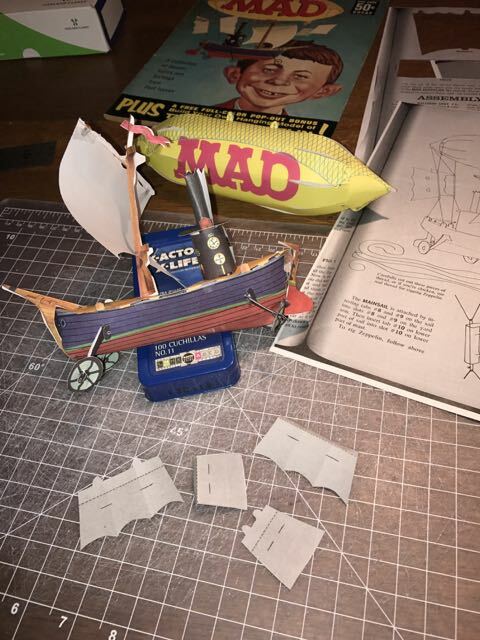 I had decided to cut out the original inserts in this yellowing, well-read and folded-in copy and make the mobile with old paper, not my color copies. One interesting pre-step of the mobile assembly was that I needed to find straws. I didn’t want to buy them since I don’t need more than the six that Clarke’s instructions call for. Freely available everywhere, they were not hard to find (even in the oceans). After my first run to Popeyes down the street, I realized that Clarke’s design called for “king size” 10-inch straws. The Popeye’s straws were compostable, and only 8 inches long. Luckily, I found 10-inch straws at a Starbucks. That was easy! 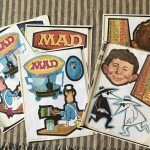 OK. Time to make this classic MAD special. The main parts at the beginning of assembly. Made a few notes, noticed a missing ruler. 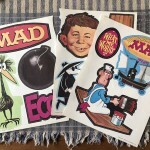 Ready to cut up a MAD mag. Note to self: do not tear old paper. If you look at the design that Clarke’s supplies, you will see that the straws and threads are all measured. 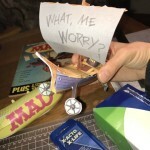 Somehow Clarke left out the fact that a ruler was needed to assemble this mobile. I have a metal one I use all the time, so finding one wasn’t a problem. 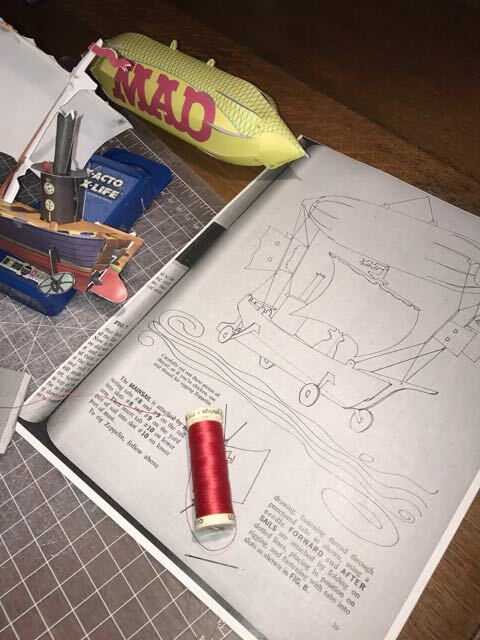 Since all the instructions point the young 1960s MAD reader to his mother’s sewing kit, I guess a tape measure would work just as good. 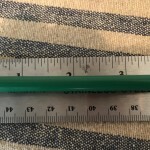 Second, there are two very important tips in the instructions: do not puncture the tied off parts in the middle of the straws, and – this one needed a magnifying glass to read – the punctured ends of the straw are 1/8 an inch from the edge. That’s all you need to know to get started. I tried to tear out the first inserted page and the 50+ year old paper was dry and tore in a way that could have destroyed the mobile parts. I used a blade to cut the rest. Clarke’s hashed lines made the cutting easy. Cutting the straws was easy, but my compostable straws didn’t cut as well as the plastic. 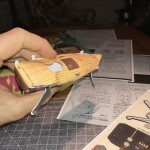 These steps were all quite easy compared to the zeppelin assembly. 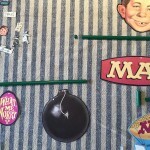 Then, I followed the instructions and measured out the straws and parts while they were laid flat on a table. 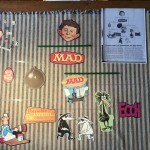 I used Clarke’s illustration to place the parts flat on my table, much like the mobile on the MAD Follies cover. Next step(s): time to thread it. Other than measurements and Clarke’s “thread either free or punctured” rule, there are ZERO instructions about how to tie off the parts. Like stringing his zeppelin, this proved to be the hardest part. First, what kind of thread should I use? I had single-strand and a thicker type from my sewing basket. I was lucky to have a needle with a large eye, so I choose the thicker thread. It caused some problems with making the knots, but was easy to wet the ends and thread it through the needle. 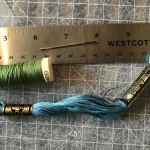 As for threading method, I ended up pulling a long piece of thread through the mobile part and tying the very end of the thread to the part while keeping the needle in the other end. Then I stuck the needle through the straw and pulled the string through. 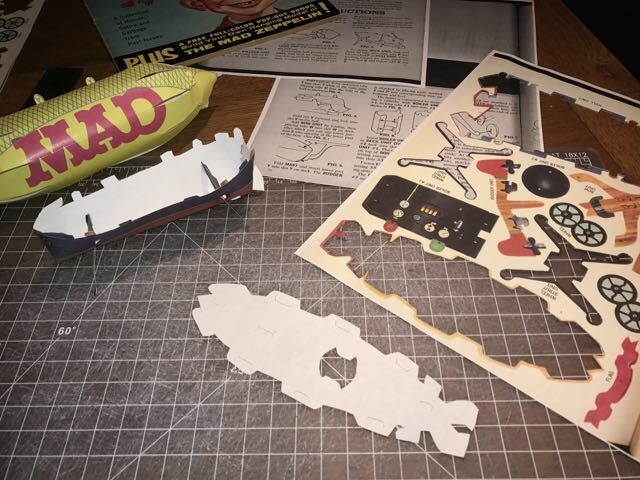 This method worked for most of the pieces, but the “middle” parts (Alfred’s head, the MAD logo, below the zeppelin) as well as the thread in the middle of the straws didn’t work this way. 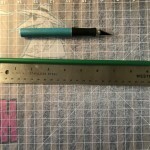 I made a list of steps for what I think is the best way to thread (most of the time): 1) thread needle; 2) put through mobile piece; 3) pull through and tie off bottom end; 4) measure from straw; 5) hold with fingers, use needle to tie off; and 6) trim ends. Threading the mobile was easy, except for getting the measurements to be exact. It was very hard to tie off a piece at exactly one inch. Or six inches. I had to re-do a few parts after the final measure came up too long or short. This took some patience, which made me wonder if the children in 1966 actually had the patience to get it all right. In the end, I will say that the measures were very close to what Clarke wanted. Fingers crossed that the mobile will still balance. Detail of cut straw bits. 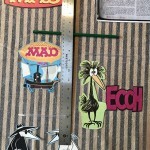 Measure to space out parts. Thread the sides, not the middle. Parts connected, ready to hang. This Post: Gifs to Amuse Your Soul. Part 1 of assembly is here; Part 2 is here. 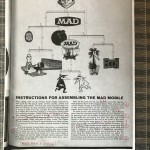 After assembling Bob Clarke’s MAD zeppelin (LINK), I had already turned my attention to Clarke’s 1966 mobile MAD Follies no. 4 insert. I had bought a very nice copy of the Follies and I had already made color copies of the mobile pages. Unlike the zeppelin, Clarke’s mobile was two-sided. 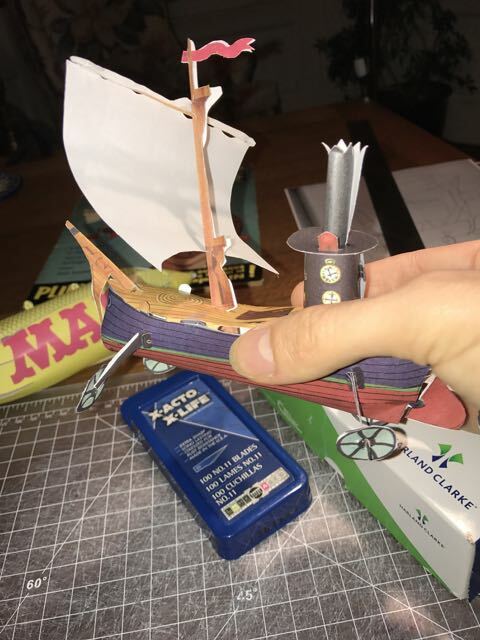 He designed the pieces to only have the hash line on one side, so I was instantly unsure how to cut two sides out in a way that looked good glued together and didn’t cause any kind of balancing problems. So I sat on the assembly project for months until I decided to buy a lesser-grade copy of the Follies that still had the insert. Not only did the copy I bought have that pulpy/musty smell, yellow – almost crisp – pages, and serious foxing, the guy that sold it to me shipped it rolled in a tube! 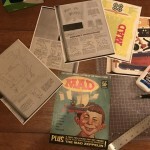 For the first time in decades, I was ready to destroy a copy of MAD magazine… (to be continued. See links above to keep reading). As a teaser post, I created two gifs from the assembled mobile. It is a dynamic, no-sided object, so I still don’t think I took a perfect photo of it hanging complete. The gifs show its kinetic properties quite nicely. V.A.L.I.S to PKD. Come in, PKD. Figure 4: An easy one. Figure 4 and my work pile. The deck is cut out. 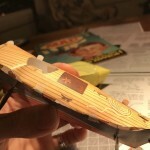 Looking at the Deck and Hull Units, one can easily see that the outer edges of each part are mostly tabs and slots. Clarke chose not to include an illustrative figure to show these two parts connecting. 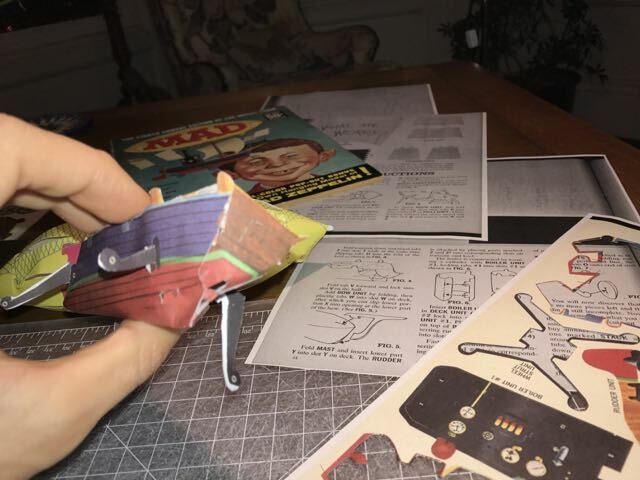 We will never know why he thought the super-easy Figure 3 needed to be illustrated when I had major struggles putting the Deck Unit into and on the assembled Hull. 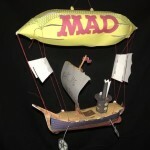 I think one difficulty for me was the fact that I made the color copies of the MAD Zeppelin with basic 20lb copy paper. 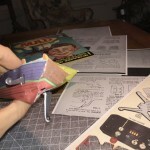 TIP: At this point, I realized that I should have used a heavier stock of paper that was similar in weight to the paper stock of the original insert. 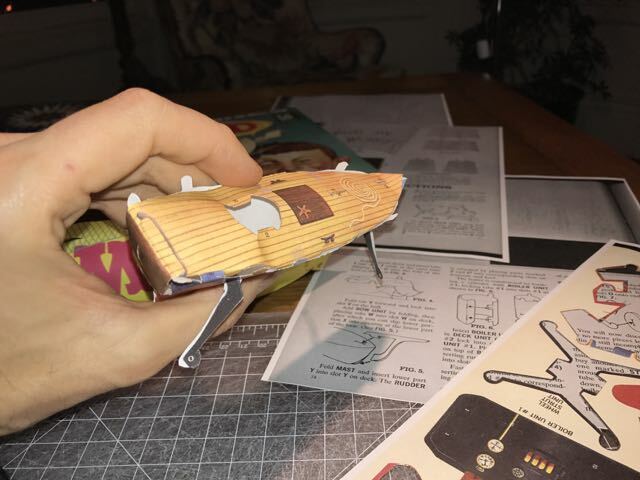 My copy Zeppelin felt very fragile at this stage of assembly, and it got more delicate and precarious for the final bits of assembly. 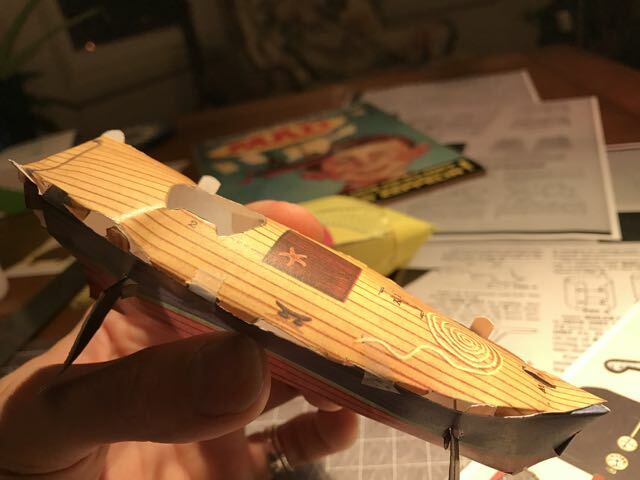 TIP: I had to make the cuts on the tabs (Tabs P and Q) of the Hull and Deck deeper in order to make these pieces insert in a way that didn’t keep the deck from popping up and out. TIP: As you can see from my photos, I put small pieces of tape over the middle connections of these two parts. They kept popping out as I tried to work the end tabs. Not pretty, but it keeps things together. 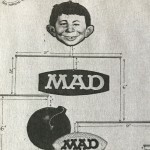 When the 1965 Worst From MAD No. 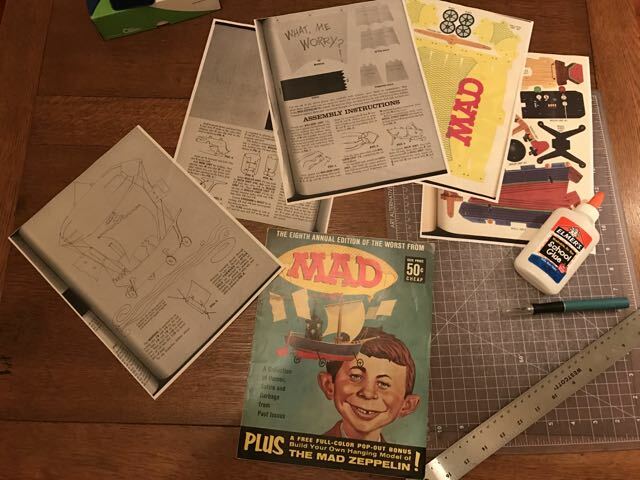 8 copy arrived in the mail, I went over to the copier machine at work to make copies of Bob Clarke’s MAD Zeppelin insert. I didn’t put much thought into how to make copies. Fortunately, Clarke made all the parts one-sided with perforations that could be folded over to make a second side. 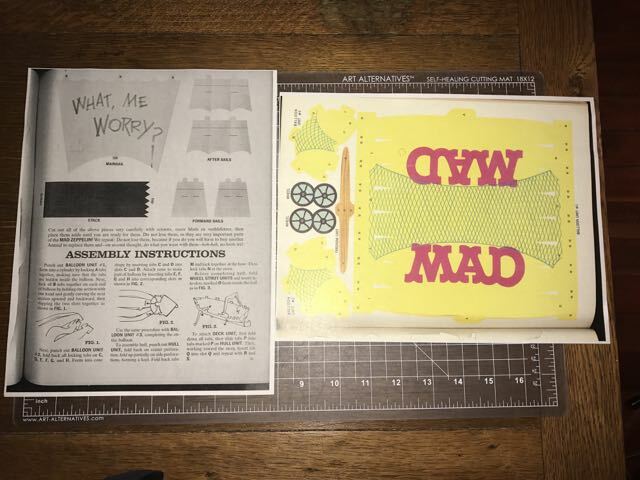 I quickly realized that I would have to push the spine of the MAD down a bit to get the parts closest to the gutter to lie flat for the copy. Yikes! This pushing caused some of the die-cut parts to partially come unattached. There goes a possible grade-reducing defect. Even with moderate pushing, the color copies had a perspective “smear” near the gutter at the magazine’s spine. 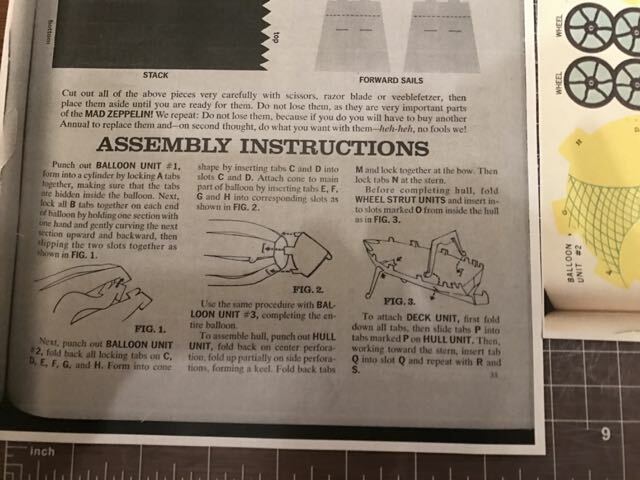 This can easily be seen in the photo showing most of the Zeppelin’s Balloon Unit (Clarke chose to capitalize the word Zeppelin and its smaller parts throughout his instructions). Look at both parts labelled Tab A and you can see the difference. I wondered if this would cause the MAD Zeppelin assembly to be a bit off. Since the Balloon was Figure 1 of Clarke’s instructions, I hoped it wouldn’t come out too bad. As we shall see, another part caused the biggest headache, and it wasn’t smeared in the gutter. 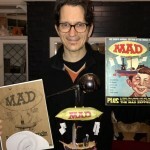 I assembled Bob Clarke’s 1965 MAD Zeppelin (so you don’t have to). 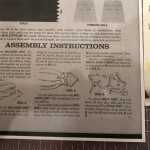 Here are the complete assembly instructions: Part 1, Part 2, Part 3. Thus brewed a perfect storm for a geek collector. First, I went online to see if anyone had posted scans of the parts. I also searched for modern photographs of Clarke’s Zeppelin totally strung and assembled. 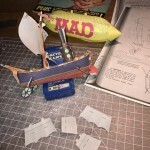 I couldn’t find anything online, but did discover a world of paper object and model making. Cool, but, wow, the Internet had zero MAD Zeppelin images or how-tos. Guess that means I’m buying an expensive intact copy of the ’65 Worst From special and making color copies. Old School pic of Frank “12 Galaxies” Chu. Leon lookin’ mean at Cell. Ooooh…. 2004. Blogs were exploding. Flash drives were a rarity. Bush’s wars drug on. And good ole’ Happy Feet was on the webstreams. 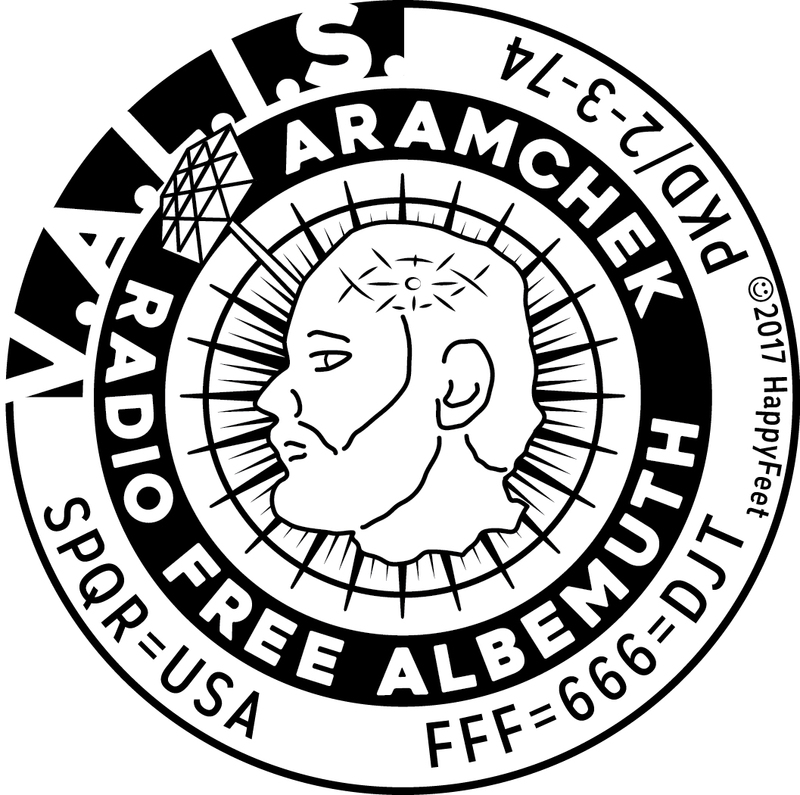 With the recent backing up and rooting around the site, I realized that I still keep a copy of the old version of this site (I call it 2.0) up and running. That’s Jacqueie Ben-Eliezer in the masthead (RIP), Frank “12 Galaxies” Chu with the sign, and Mr. Leon Rosen looking all mean with the sticky note (that says “Leon has a posse”). There’s also my fun “@bomb” favicon, the secret <3 (did emoticons exist in ’04?) 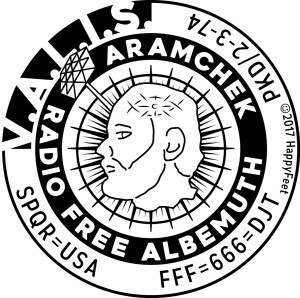 link on the masthead, and links to all the other pages I had running at the time. Once blog tech got easy to install and use, I basically took the same themes and used them as categories on this version (WP v3.0). Guess this is my #TBT post a day late…. The Spookeasy Website is UP! Mr. Nobody’s Spookeasy, Halloween 2014! Just a teaser for now: Over the past few years I’ve been working with Scott Levkoff making very fun adult-themed puppetry events. This is only a sliver of the fantastic vision that Scott has for interactive play, but I have been a minion for his swamp-god Mr. Nobody (black light puppetry… a dream fulfilled at last! ), Mr. Nobody himself (and VERY hungry), as well as animated black-light objects, and part of an “animatronic” puppet fortune-telling bit. It’s always a pleasure to work with Scott, so always hard to say no to his invitations. Coming up, I will be animating objects/puppets for Scott at :::: The first-ever San Francisco Spookeasy Halloween Extravaganza is a new, daring, bold and sophisticated multi-evening experiential destination party that will transform Chinatown’s Great Star Theatre into a scintillating circus-like, madcap séance soiree beckoning back to life ghosts, spirits, and specters from the raucous and rollicking red hot era of 1930’s Burlesque and Barbary Coast Vaudeville in a decadently opulent Max Fleischer-esque ‘ToonTown’ parallel universe’s haunted Prohibition-era Speakeasy. Sounds fun, right?! 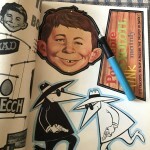 More details and pics coming in the following weeks….